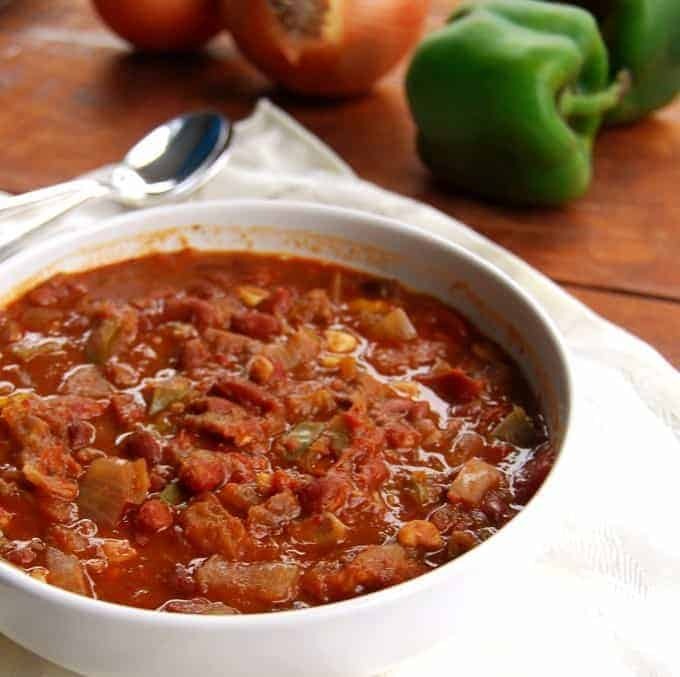 This healthy, fat-free and sodium-free crock pot chili has beans, mushrooms, zucchini, bell peppers, and more. Each serving has 21 g of protein and 15 g of fiber. It’s been a while since I had a giveaway for you, largely because I’ve been simply too busy to take on and fulfill commitments. But I am thrilled to announce today a cookbook giveaway that’s just perfect to ring in the New Year, resolutions and all: Dr. Joel Fuhrman’s Eat to Live Cookbook. I have long been a fan of Dr. Fuhrman so I was only too happy when I was asked to review the book which is packed with 200 recipes for everything from smoothies to breakfast recipes, dips, salads, soups, main dishes, fast food and desserts. Most recipes are vegan– in fact, the non-vegan recipe section is separated out at the end of the book so you don’t have to go there unless you want to. But this is not just a cookbook. Dr. Fuhrman includes valuable tips on living a “nutritarian” lifestyle– a lifestyle that focuses on eating nutrient-rich, natural foods. Nutritarians, he adds, recognize that plant foods have disease preventive, therapeutic and life-extending properties. Okay, so as vegans you already knew that, but it does feel good to have a doctor confirm it, doesn’t it? The book also includes practical tips, like how to pick out the perfect fruit– something I haven’t mastered after years of being an eater and a cook. Do you know, for instance, how to tell the difference between a ripe starfruit and an unripe one? The book even includes a list of Dr. Fuhrman’s top 25 super foods and an Aggregate Nutrient Density Index (ANDI) score system for many common foods in our diets. I bookmarked a ton of recipes as I flipped through this book, including Dr. Fuhrman’s Famous Anti-Cancer Soup, Lemon Cauliflower Risotto, Quinoa Mango Salad, Goji Berry Walnut Squares with Chocolate Drizzle, and many more, but the first recipe I tried was the Crockpot Mushroom Chili because the recipe had instant appeal in these frigid days of winter. It contains a mix of vegetables and beans and was rich and smoky and absolutely delicious. Even better, it was fat-free and salt-free. 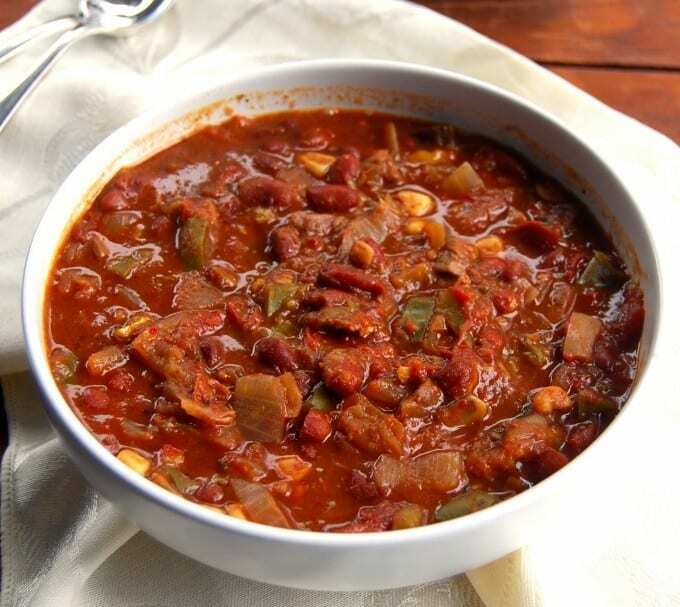 A single serving of this chili packs 21 grams of protein and nearly 15 grams of fiber. How amazing is that? Even Desi, my resident omnivore, loved the chili– despite the fact that it was healthy. You know how those guys are! This is definitely going to be my go-to book in the new year. 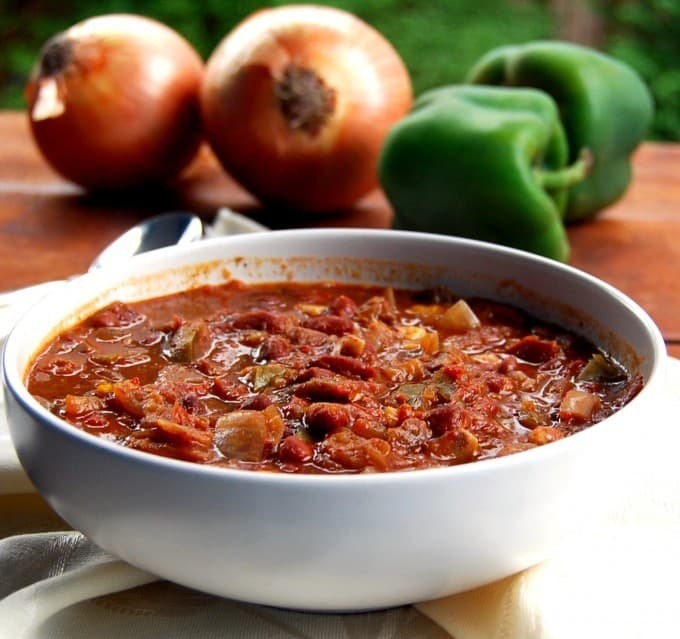 Dr. Joel Fuhrman's recipe for a healthy, fat-free and sodium-free crock pot chili. This recipe has 21 g of protein and 15 g of fiber in a single serving. Combine all infredients in a crock pot. Cover and cook on low for 7 hours. Whew, so aren’t you glad that 2013 is coming to a close? I know I am. This was a busy year for me, and a rather eventful one for Holy Cow! In November I moved the blog to a WordPress platform from Blogger, where she had lived since birth, and the move was fairly smooth although not uneventful. I lost many subscribers despite my best efforts, and so many of you were kind enough to sign up all over again. Thanks for sticking with me. I do appreciate the love, and I apologize for the inconvenience. 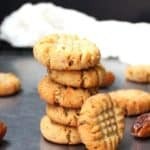 After a rather slow period, I have also tried harder to keep up with the blog and post new recipes in these last couple of months. 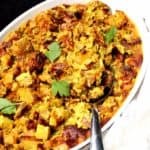 Desi, my resident critic, recently reminded me that I am not writing as much as I did on the blog– you just post a recipe intro and the recipe, he complained. If you have missed the chatter too, I love you for it and admit that I miss chatting with you. I hope to do more of it in the new year– it”s definitely one of my key resolutions. Here’s wishing all of my readers have on the cards a brilliant new year, where all of your wishes come true. Happy new year, everyone! That’s wonderful. A happy new year to you! My New Years Resolution is to get my family on board to eating healthy. Krys, those are great resolutions. Here’s wishing you great success, and a very happy 2014 to you, your husband and your boys. Happy New Year. My resolutions are: garden more, make great gf foods for my autistic son, and cherish every moment with my boys, and my husband. To maintain a regular meditation practice. I’ve been resolving to start meditating for ever now and never did it. This might be the year. Thanks for the inspiration. 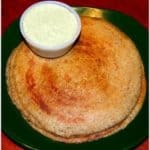 I organize the Atlanta Vegan and Healthy Lifestyle Celebration Meetup. I have some members who aren’t vegan or even vegetarian. And some of the vegans are far from nutrarians. I resolve to learn a little more about the nutritarian philosophy and techniques to help them make better choices. It’s not enough just to say that vegan food is yummy, cruelty-free, and “healthy”—-have to really become an expert in this. I’ve heard of Dr. Fuhrman, but never read any of his books. Would love it and make good use of it! Was really scared when I couldn’t get on to your site a few minutes ago (looking for the mango quick bread recipe). Glad you are up and running and that I can look forward to your blog for 2104! By the way, your banana cupcake muffins with the peanut butter frosting are great—but I had some frosting left over. You’ll never guess how I used it up? Warmed up, as a dip for apple slices. Yum! So I got double mileage out of your recipe. Hi Ellen, what a great idea to use the frosting as a dip. I have to try that! The site was down today for several hours because the servers for Bluehost were down. It really was scary for a while! 🙂 Sorry about the inconvenience, and good luck for the giveaway! And a very happy new year to you. I hope to become more active from my sedentary life (had breast cancer last year and can’t seem to get going again). Love your blog and following it for years. Don’t worry about posting too much chat, what you do for us is very appreciated even without it. Deborah, kudos to you for getting so far! I have a feeling this new year is going to be really great for you. 🙂 Thanks for your kind words about the blog. Your recipies always sound delicious!! My resolution is to keep working out and lose my belly fat. G’day! 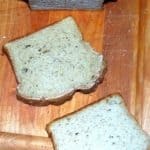 The recipe and photo look yum and healthy, true! Thanks, Joanne, and very happy new year to you. N, Happy new year, and that’s a great resolution. My resolution this year is to not participate in self-hatred. I get depressed and get in a downward spiral of binge eating. 2014 is the year I break free of my disorder! Jennifer, not participating in self-hatred is a good resolution, and one many of us could adopt. It’s certainly going on my list. Thanks for the inspiration. Hi Linda, You sound determined and I know you will do it. here’s wishing you a 2014 full of good health and happiness. My apologies if myfirstcomment went through, but it looked like something went wrong. My resolution is to gain control of my health this year. I love your photos as always! To Paint and draw more. How lovely. Here’s wishing you a 2014 full of beauty and color. Hi Anusha, thank you for your very kind message– you made my day. 🙂 I promise to chatter more — I definitely want to. And yes, who doesn’t want to lose weight? I definitely need to. And I could also definitely use some patience in my life. A very happy new year to you and your family. Hi Vaishali, great to know about the giveaway. I just pitched my lot in too. There are two things I would love to do in 2014: run a full marathon by year end and go completely gluten-free. I also want to get started on my own herabarium, so I know what goes into the herbs that I love to consume. Hi Vani, those are great resolutions, and ones I have no doubt you will accomplish. I am in awe of anyone who can run a marathon. 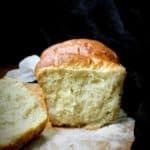 I plan to post even more gluten-free recipes this year, so stay tuned for those. A very happy new year to you. Diana, a very happy new year to you! I would love to have you as a recipe taster in my kitchen, or at the least as a guest for dinner if you ever happen to be in town. Thanks for your kind words! Happy New Year Vaishali! I hope I will watch less TV and read more. Hi Chitra, I could definitely use that resolution — watching less TV — although I don’t know if I dare do it. 🙂 I am hopelessly addicted. 🙂 A very happy new year to you. My new year resolution is to take it easy and spend more time with my family. Spending more time with family is on my list too. Happy new year! My resolution is to quit procrastinating and see my projects through to completion! A noble resolution! Good luck, and hope this new year gets you to your goals. Sounds wonderful, Twilla. Good luck, and hope you get to your goals! Wishing you and your dear ones a Very Happy Healthy & Peaceful New Year! And so I shall , by carving some quality time for – spending more time with family, my reading, volunteer work, & looking at the positive side of life !.. long time reader . I have enjoyed reading your posts over the years and trying a lot. I have been diagnosed diabetic recently. My goal for 2014 is to make changes in the food andlifestyle so I can try and beat it. Hi Laavanya, thanks for the comment! I am thrilled you’ve enjoyed the blog. Good luck with your health. As you likely already know, a vegan diet is highly beneficial for diabetics and I hope you will beat it! Oh my! I came here for the first time today while searching for some dairy-free alternatives for Palak Paneer. My NY Resolution? I need to be more strict about being gluten-free. Too often, I sneak in a little something at a restaurant that I know probably has gluten in the sauce and think it won’t be a problem…but sadly, it is. Hand in hand with that is to take the time to cook more for myself and my fiancé. There is a bag of red lentils in my cupboard begging to be made into dal soup! Hi Vaishali,I enjoy reading your posts! My New Year resolution is to incorporate more fruits and veggies into my diet. I recently got myself a Nutribullet and have been using it diligently. Hi Krithika, great resolution. I have never used the Nutribullet but it sounds like a good tool. This mushroom chili looks great! I am attempting to drink more water and amp up my veggie intake this year, while decreasing “bad” carbs. I resolve to cook and eat more vegan for health reasons. 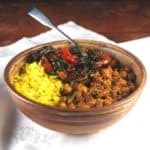 I am not Indian, but I cook a lot of Indian food. My husband and I just transitioned to Dr. Fuhrman-style eating, mostly to lose weight but also to get healthier. I’ve been inventing a lot ofIndian-style dishes for our dinners (spicy dhals with lots of greens and some tofu). It is weird not to be creating the seasoned oil, but the food seems to come out nice and tasty. 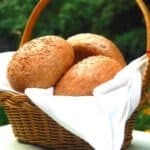 I went looking for some Fuhrman-style recipes (or at least recipes that I can adapt for Fuhrman-style eating) and found your site! I’m really happy I did, and plan to browse it for inspiration and recipes. Thank you! Hi Maddalen, welcome to Holy Cow! and so happy you found your way here. 🙂 I love the Fuhrman style of eating too and try to follow his GBOMBS guide whenever possible. Hope you find what you need here, and let me know if you have questions! Just posting once again … I made this stew this AM with a few slight variations (cranberry beans, basil and much more hot peppers) – it was going to be for dinner, but hubby wanted some … and he had seconds! SCORE! Thank you! Maddalen, your additions sound delicious. Glad you liked it! 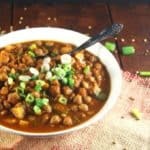 I love chili, I love mushrooms, and I’m always looking for vegan versions of traditional dishes. I’ve been using Gardein with kidney beans, etc., for my recipe, but using mushrooms, which I eat tons of just roasted, is a great idea because I don’t think the “fake meat” adds much to the flavor, and it’s kind of expensive. What do you think of Gardein’s products? BTW, you have great blog: great recipes, great attitude, great writing. I’m a big fan! Hi John, thanks for your kind words, and welcome to Holy Cow! I agree on the fake meat– it rarely has the right texture to substitute for meat, and is almost always bland. I have used some Gardein products and while they are good enough as vegan substitutes, they too don’t have the right texture. And yes, they are expensive which is definitely a consideration for me. 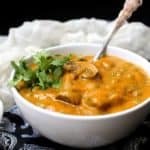 I often just use TVP chunks when I want a “meaty” texture in stews and curries and when vegetable substitutes like mushrooms or eggplant won’t do. 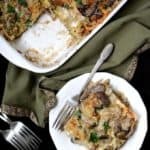 They also add a strong protein hit, they are relatively easy to find compared to other meat substitutes, and they are also fairly inexpensive. My goal for 2015 is to be as helpful as I can to as many people as possible to help others reach their nutritional goals. As for me I plan on just eating more greens.